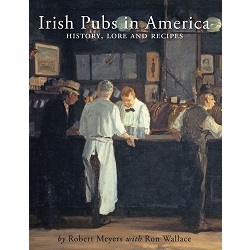 This one-of-a-kind coffee table book features more than 50 Irish pubs throughout the United States.336 pages of beautiful photography, rich history, and special recipe section. Bob Meyers: Bob Meyers’ career was split evenly between the U.S. Foreign Service and the private sector. As a diplomat, he was responsible for media relations is several European and Latin American countries and served as a negotiator and U.S. Spokesman at the Tokyo Round of Multilateral Trade Negotiations in Geneva, Switzerland. He served as Director of the U.S. Government’s Foreign Press Centers in Washington, DC and New York City. At one point in his career, he was a Special Assistant to the White House Staff Director. In the private sector, Meyers was responsible for global employee communications for AlliedSignal (now Honeywell) a Fortune 100 company. He later served as Vice President of Corporate Communications and Investor Relations for Scientific-Atlanta (now Cisco), a Fortune 500 company. He is the author of the award-winning coffee-table book Bygone Treasures and Timeless Beauties: Barns of Old Milton County. The first edition sold out in one month in 2011/12. He and his wife Linda have lived in Georgia for 25 years. They have two daughters and three grandchildren. Ron Wallace: Prior to retiring, Ron was President of UPS International where he was responsible for UPS in more than 200 countries and territories with more than 60,000 people under his direction. He also served on the corporate management committee that oversaw the day-to-day operations of UPS and its 400,000 employees. He was chairman or co-chairman of 33 boards of directors of highly successful companies. In his earlier days he was a professional race car driver and played semi-pro football in Europe. He serves on numerous boards and foundations, two of which he was a founding member. Shortly after retiring he was named as the Chairman of the Governors commission and charged with forming the City of Milton, Georgia. Wallace, a campaign consultant, wrote the book Power of the Campaign Pyramid and has completed a leadership book titled What Brown Did For Me. Ron and his wife, Kate, co-founded Olde Blind Dog Irish Pub, with two locations north of Atlanta. They have a daughter, and two grandchildren.